I just realized I have had this post in my drafts since last Thursday… oops. Once again, blogging is all fun and games until you get off track. I lost access to wifi over the weekend which always seems to hinder me a bit, and as much as I love writing this to share my experiences with everyone and reflecting on my days, it definitely takes some time. It has been a very full past few days and the blog has fallen through the cracks. I do have priorities like class work (which picked up some here in our final week) that I have to do before I let myself blog. It also hit me that this is my last week in Spain and Facebook and the blog and all of that will still be here next week when I arrive home, while the option to go out and explore the city in the afternoons and evenings will not be. 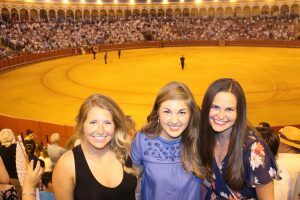 Huge parades, bull fights, and the sweltering Spanish heat oh my!! 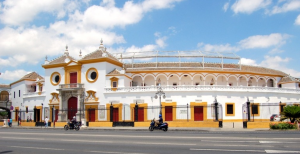 Last Thursday was Corpus Christi day here in Sevilla and the whole town turned out to celebrate this holy day. I did a little bit of research on this holiday and learned that it is the Catholic day to celebrate the presence of the body of Christ in the holy water. 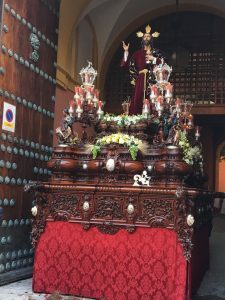 It is primarily only a holiday celebrated in Spain, and boy do they celebrate! 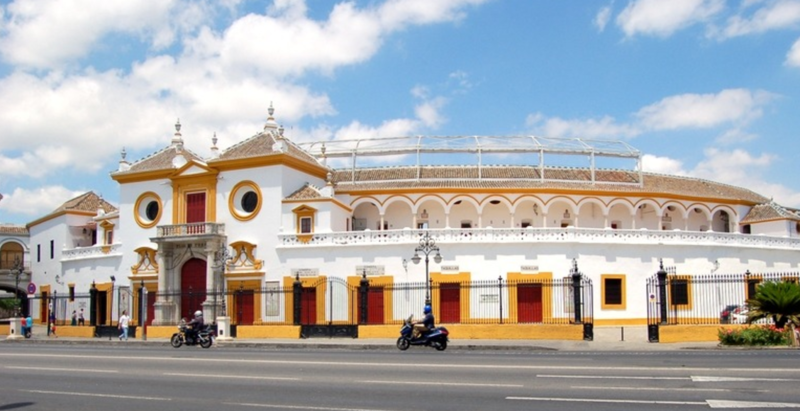 It was refreshing though that unlike America, where a lot of stores and restaurants are still open on holidays, the people of Sevilla all shut down their shops and give their employees the day off to worship and spend time with their families. A small group of us ventured down to the parade early Thursday morning and were greeted by a swarm of crowds and music and a parade. 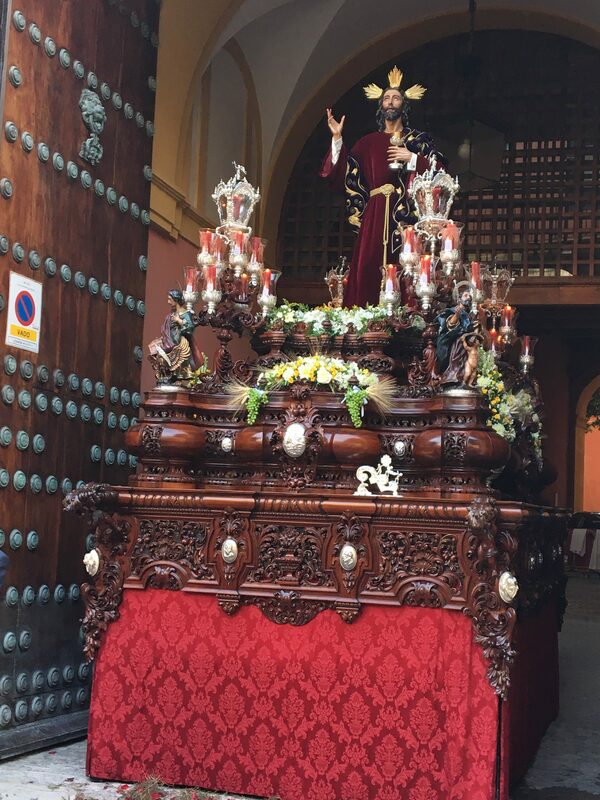 I immediately spotted this- just one of the huge altars that is carried down the streets. It is just as heavy as it looks and the men who carry it practice all year long! Isn’t it beautiful? We stood outside the cathedral for a few minutes and watched all kinds of important religious and city leaders enter for a special service. This was interesting because in the States, one of our main principles is separation of church and state but here they were right there together alongside the whole city. 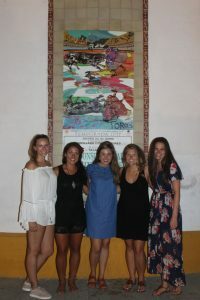 Thursday evening was an exciting one as we were headed to the bull fights!! 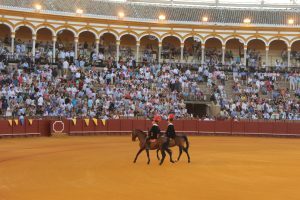 I had NO idea what to expect and I am going to be real honest here and say that I thought it was similar to a rodeo in the States and was expecting the rider to sit on the bull and fight another rider and their animal while trying to stay on. Well I couldn’t have been more wrong hahaa. 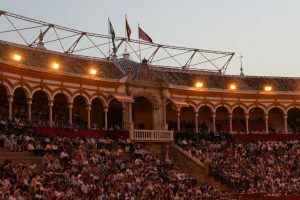 We attended an informational lecture earlier in the day that was really helpful as the speaker explained all of the pomp and pageantry of the bull fight, as well as about about how it all works. There is a very specific order and structure to the fight. The bull rider is actually called a matador- and the matador trains from the time he is 8 or 9 years old- to learn how to fight these bulls. They are not just let loose in the arena to fight, but have several objectives before they actually kill the bull. 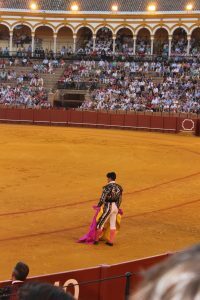 The first one is when the bull is released into the ring, he is tested for ferocity by the matador with a magenta and gold cape. 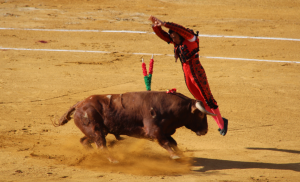 The matador confronts the bull by performing a series of passes and observing the behavior and quirks of the bull. 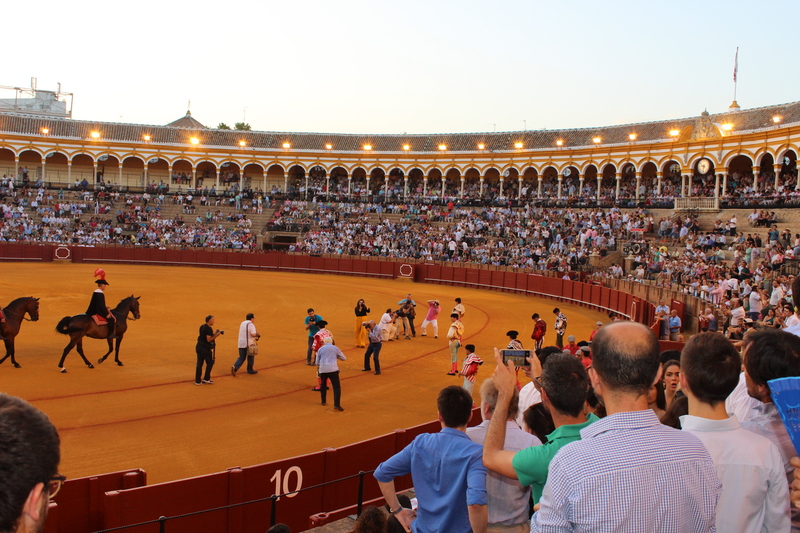 Next, someone called a picador enters the arena on an armed horse. 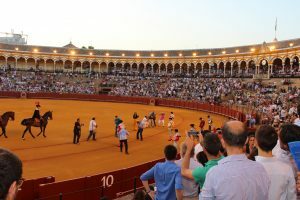 At this point, the picador (guy on the horse) begins to stab a mound of muscle on the fighting bull’s neck, which weakens the neck muscles and leading to the animal’s first loss of blood. 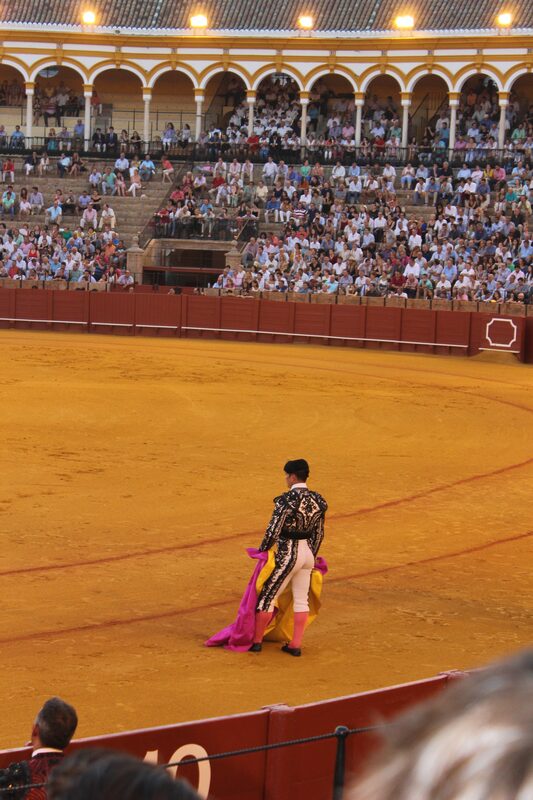 There are three banderilleros- which are short barbed sticks (showed below)- that are pinched into the bull’s back and eventually enables the matador to perform the killing thrust later in the performance. Notice their outfits!! I was too far away to really capture the detail of them, but they are all very unique, beautiful and so ornately decorated. And their pants are alarmingly tight, but are that way for protection from the bulls horns. We attended a fight that was for the guys who are in the process of becoming professionals- so this was the D-league of bull fighting, but still very impressive. 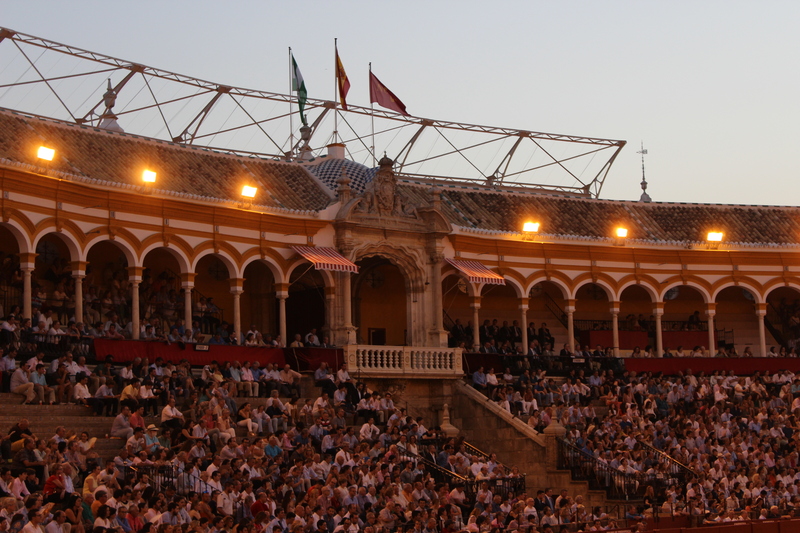 There were 2 matadors that we watched- Raphael and Pablo. The matadors are young!! These guys were 22 and 24 but a lot of them are 18 or 19 and let me just say as the relative and friend of some 18 and 19 year old boys, nothing makes me more nervous. Lord bless their mothers. 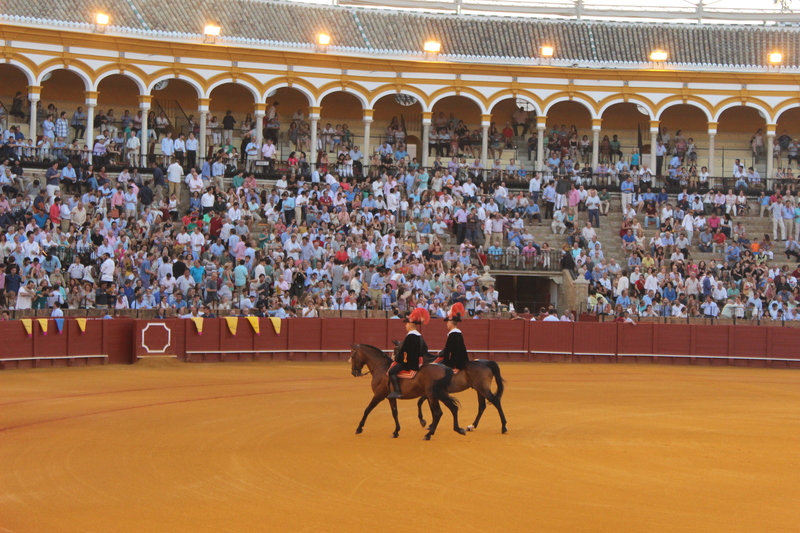 I know nothing about these guys and really only saw their picture in the program/from a distance, but I was cheering them on like I have known them their whole life and am invested in their bull fighting career. Both Raphael and Pablo were so cute and let’s be honest- watching someone fight a bull (hello macho man) makes them attractive pretty quickly haha. All of us girls were swooning a bit and yelling “GO PABLO! !” as we deemed him our favorite. Apparently he was everyone else’s favorite too because after his last fight, he got a standing ovation and people started throwing flowers and pieces of paper (assuming they had girl’s phone numbers written on them haha) down on the ground. 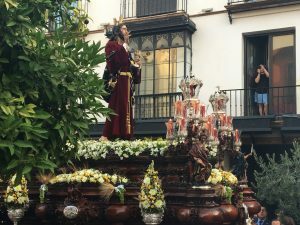 It was hilarious because the whole celebration was rather excessive/people would get a major penalty for the unsportsmanlikeness of it in the U.S., but totally just an element of the culture and tradition of the bull fighting. 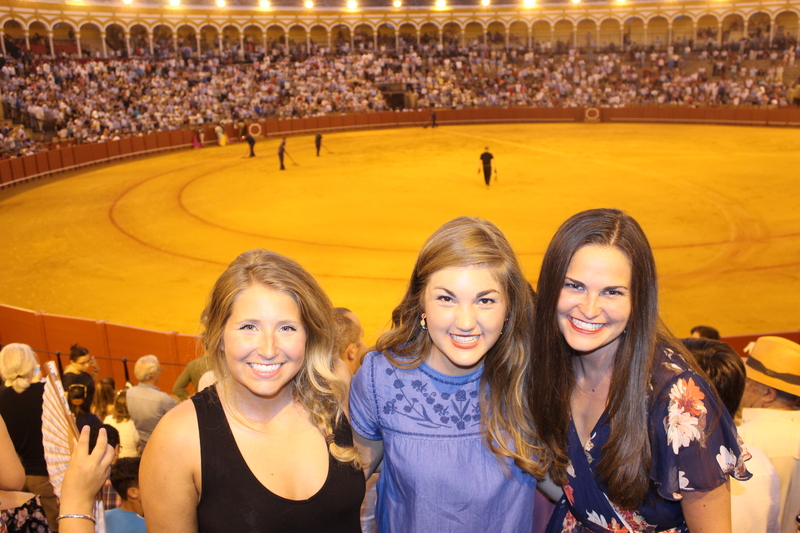 We all concluded that the bull fight was very fun and something we weren’t anticipating to like as much as we did. Oh I should mention that this was one of the hottest days we have had and it was like 104 degrees (even at 9:30 at night) and we were all dripping in sweat but still had a grand time. The next day, we headed to La Rabida and Lagos, Portugal! That recap to come.